Ilya of Murom - one of the main characters of Russian epics, hero hails from the village Karacharovo by Murom, embodying the national ideal of the hero-warrior, popular defender. 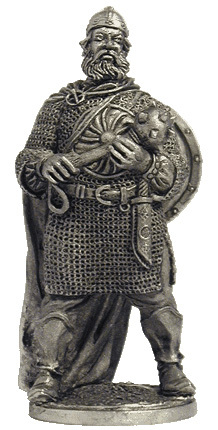 Appears in the epic cycle of Kiev: "Ilya of Murom and Solovey-robber," "Ilya of Murom and Great Idol Pagan," "Ilya of Murom quarrel with Prince Vladimir," "Fight Ilya of Murom with Zhidovin"
For a number of versions, the hero was a real prototype - a historical person who lived around 1188, although the Russian chronicles do not mention his name. The prototype of the character is historical epic strongman Chobitko, nicknamed "Chobotok", a native of Murom became a monk in the Kiev-Pechersk Lavra by the name Ilya sainted as "Reverend Iliya of Murom" or "St. Ilya" (canonized in 1643). The first written information about him refer to the 1630-th years, the tradition of the early life of Ilya refers to the XII century; XI-XII centuries burial is dated to the researchers. The relics of her husband's tomb and the remains of shattered hero, called Chobitko saw back in 1594 in the caves of the Austrian Ambassador Erich Lassota. He said that was Chobitko hero and wore his nickname ever since, once fought off enemies with his boot - "chobot." In 1988, the Interdepartmental Commission of the Ministry of Health Ukrainian SSR of its expertise relics of St. Ilya of Murom. Studies have shown the relics of that saint was exceptionally strong person and had a height 177 cm (high growth for the Middle Ages). He has discovered signs of diseases of the spine (Iliya epic from birth to 33 years could not get on their feet) and traces of numerous injuries. Cause of death was likely to hit a sharp weapon (spear or sword) in the chest. Death occurred at the age of 40-55 years. It is believed that he was killed during the capture of Kiev by Prince Rurik Rostislavich in 1204, accompanied by the defeat of "Pechersk Lavra" - allied Rurik polovtsy (kipchaks). In this case, it must have been born between 1150 and 1165's. According to legend, hero Ilya of Murom to 33 years spent on the stove, and then received a miraculous healing from pilgrims and discovered his heroic strength. In the epic "Svyatogor and Ilya of Murom," explains Ilya of Murom studied Svjatogor (http://en.wikipedia.org/wiki/Svyatogor), and dying, he blew into his heroic spirit, why force Elias added, and gave up his sword kladenets (fairy divine weapon).